Key states who joined the US-led invasion of Iraq have rejected claims by the United Nations secretary general that the war was illegal. Kofi Annan told the BBC the decision to take action in Iraq contravened the UN charter and should have been made by the Security Council, not unilaterally. But authorities in the UK, Australia, Poland, Bulgaria and Japan said the war was backed by international law. Australian Prime Minister John Howard described the UN as a "paralysed" body. And a former Bush administration aide, Randy Scheunemann, branded Mr Annan's comments "outrageous". Mr Howard, fighting a cliffhanger re-election battle, insisted the invasion was legal. Labelling the international body "paralysed", he said it was incapable of dealing with international crises. "The legal advice we had - and I tabled it at the time - was that the action was entirely valid in international law terms," he said. Randy Scheunemann, a former advisor to US Defence Secretary Donald Rumsfeld, accused Mr Annan of trying to influence the outcome of the forthcoming US presidential election. "I think it is outrageous for the secretary general, who ultimately works for the member states, to try and supplant his judgement for the judgement of the member states," he told the BBC. "To do this 51 days before an American election reeks of political interference," Randy Scheunemann said. He said the UN's failure to act in Sudan, and in other areas around the world, was proving that effective multilateralism may be a contradiction in terms. The British government - which has argued that UN resolutions provided a legal basis for intervening to topple Saddam Hussein - said the 2003 invasion was "not only lawful but necessary". "We spelt out at the time our reasons for believing the conflict in Iraq was indeed lawful and why we believed it was necessary to uphold those UN resolutions," Trade and Industry Secretary Patricia Hewitt told the BBC. Japan's top government spokesman, Hiroyuki Hosoda, told a news conference that he would be seeking clarification about the exact significance of Mr Annan's words. Polish Foreign Ministry spokesman Boguslaw Majewski said the "decisions which at that time were made by the international community in Iraq, did have legal basis". And Bulgarian spokeswoman Guergana Grantcharova cited previous Security Council resolutions which, she said, supported the case for war. 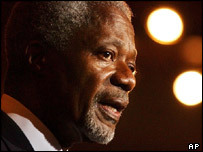 Mr Annan told the BBC World Service he hoped he would not see "another Iraq-type operation for a long time". He said there should have been a second UN resolution following Iraq's failure to comply over weapons inspections and it should have been up to the Security Council to approve or determine the consequences. The invasion of Iraq was illegal, he said, from the point of view of the UN charter. Mr Annan also warned security in Iraq must considerably improve if credible elections are to be held in January. The BBC's Susannah Price, at UN headquarters in New York, says Mr Annan's relationship with the US might be made a little uncomfortable for a while following his comments, but both sides are likely to want to play it down. US President George W Bush is due to speak at the UN General Assembly next week.